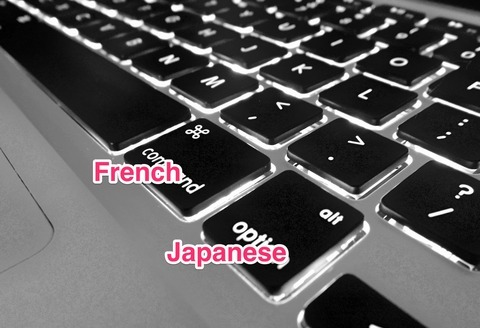 This is a good tip for Mac user who have to use multi languages. You may could switch input source by simple shourtcut on Mac, in the old days, because there were the settings for one push shourtcut setting for input source. But, the function is no more exist now, so I searched the sipmle shortcut free application on internet. I found and tried some, but they never worked well and only bothered me. 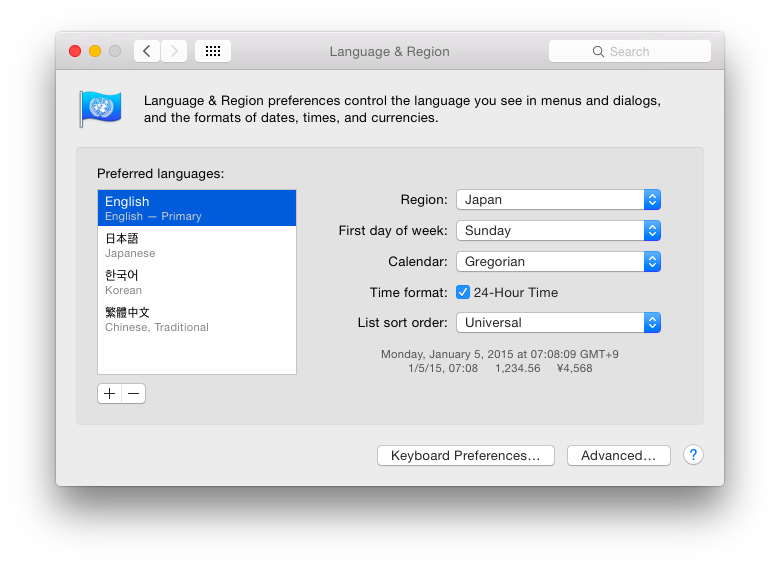 Then I reallized that when I use more than 3 language, these shortcut apps dosen't work well on Mac OS. 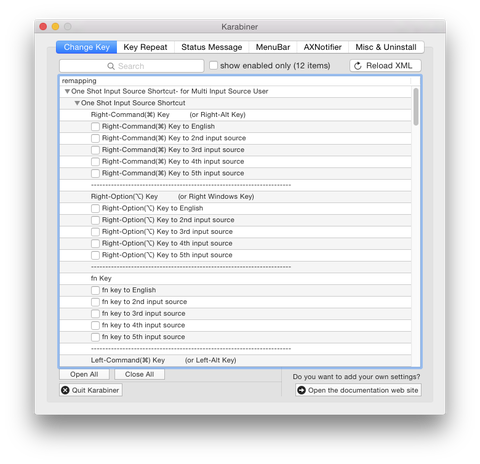 Karabiner is one of them. I made the system of more than 11 shortcut keys for switching 5 input sources at only one touching. I will introduce the way to setting this system, named "Pochi". You don't need to push [command +space] to change language any more. You can change until 5 languages(input source) at one push shortcut key. You can use English, French, German, Spanish, Portuguise, Russian, Japanese, Korean, Chinese, and every languages, of course. 2. 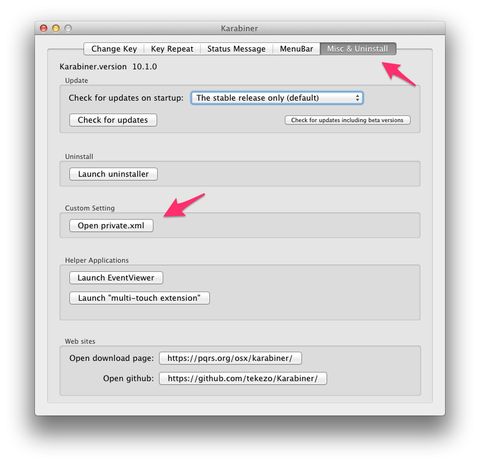 Then, launche the Karabiner app on Launchpad. 6. You can see the folder; name is "POCHI5.3". 7. Then, Open Keyboard setting and select "shortcut" tab. And check the shortcut key that is set like this picure below.
" [✓] Select next source in Input menu ⌥⌘Space "
If it is not, please click "Restore Defaults" butten, and check the second check box. 8. Then, let's return to the Karabiner. You will find the menu "Pochi - for Multi Input Source User" on the top of remapping lists like the picture above. Click "Input Source Shortcut", and 12 type of shortcut settings will appear like below. 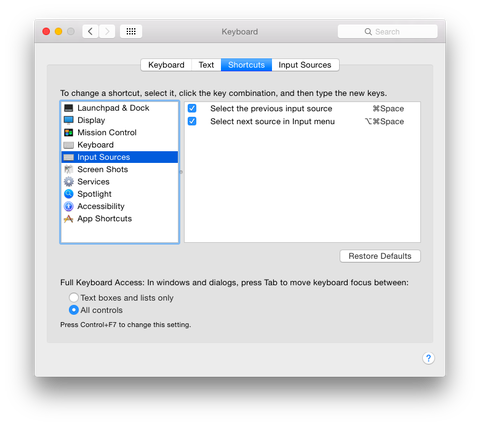 "Right-Command(⌘) Key to 2nd input source" means "Use Right Command Key to change to the second language." 10. When you check the box you want, the setting will work right now on. You can set one input source to many shortscut keys, but you can use only one action by one shortcut key. So please check only one Input sourch for each shortcuts. 11. You have to notice about the number of the input source that you have to use. Maybe you use [command + Space] to change input source. When you use this command, the order of the sourses change following to the input source that you have used right before. So let's check the order number of the language you want to use. 'Left-Control(^) Key + Number Key'. And if you push Control+1~5, you can find the input source you want to use. You can use another shortcut settings below as the number. Or you can also use [Option+Command+Spanse] to check the order of input sources. (1) First, change to English. (2) Press [Option+Command+Space] to change to the input source that you need. (3) Check the number that you pressed to change the input source. ※ You can't see the name of languages displayed on center. Please watch at the language flas mark on the upper right. ※ English always must be the first input source. If you want to switch to Chinese and when you press [Option+Command+Space] 3 times to change to Chinese it turns to Chinese, that meas Chinese is the 4th input source. If you press 4times, it is 5th input source, you see. ※ There is some language IME that use more than two input sources like "ことえり(Kotoeri)”. I recommend you to check off the check box except "Hiragana". The order of the input sources changes is from the sistem of languages. You can change the order in "Sistem Preferences > Language & Rejion". 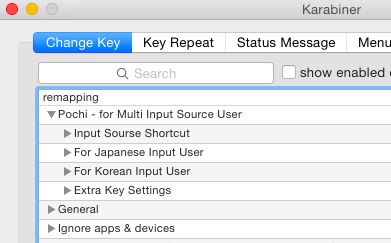 I think useful shortcut is the first one, "Right-Command(⌘) Key"
And also use "Left-Command(⌘) Key to English". If you want to swich them faster, I recommend you to use [Left control(^) + i ] or [Left control(^) + k ] . Because you can use the shortcut keys in home position. And you'd be better to change Caps Lock and Control by Mac OS setting. I use [Left control(^) + i ] to change to Korean. It's possible to push in home position, very confortablly. [Right Command] to KANA Key. [Left Control(^) + J] to Japanese. And I made some settings for Korean input user. This is additional settings I want to use in some situation. #1. For Pochi, you can only use 5 input sources. When you use Kotoeri, I recommend you to remove Katakana, Romaji, etc. withtout Hiragana. Then, back up "private.xml" and, copy these texts. and paste this texts next to <root> in "private.xml" text which is in "Karabiner" folder. 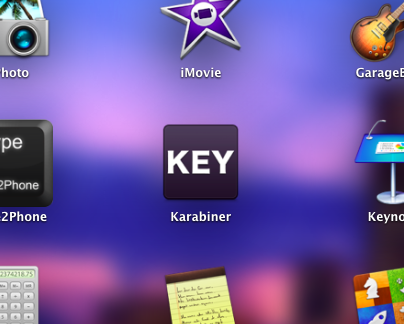 And move "Pochi5.3" folder only to "Karabiner" folder. Then, you can use both original settings. If there are only 3 lines in "private.xml", just delete the file and go to 5. #3. If you use more than 3 input sources, you can't use toggle key. Please press [command+spase to ] for the language once. #5. If you choose [Command_L(⌘) + Space to **Input Source], you can not select input source by Command_L(⌘) + Space as usual (the name of input source appearing on the center of monitor). If you rewrite the code, you can add new 6th input source or more shortcut keys.